OMG, I am in love with this Italian Black Truffle Salt I got at Savory Spice Shop. I posted about this new shop in downtown Santa Rosa and I am just getting to trying out the goodies I purchased. I pretty much made a beeline to the salt section and went straight for the sample bottle of Italian Black Truffle Salt. Heaven. Complexity. Earthy. Sensual. Perfect! And the bottle I purchased was very reasonably priced. 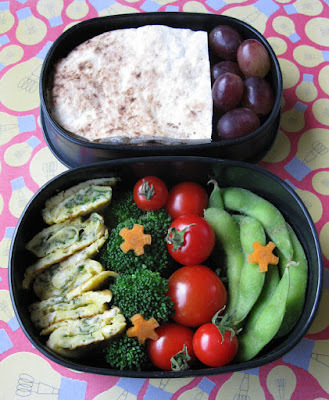 I thought I would try it in this bento box lunch, using eggs from Hector's Honey. Hector is at many of the Sonoma County farmers markets, and his eggs are highly sought after, for good reason. I urge you to find eggs from a local farmer and compare them to the ones you get at the grocery store. Such a difference in quality and richness! In the upper compartment: pita bread slices and grapes from De'Santis Farms. In the lower compartment: my own version of tamagoyaki (a rolled up omelette with spinach from Offerings of the Land in Glen Ellen and a tiny pinch of Italian Black Truffle Salt), steamed broccoli, carrot flowers, cherry tomatoes from The French Garden in Sebastopol, and steamed edamame. I used this new bento box that I picked up at Daiso for 6 bucks. Unfortunately, I didn't notice that the top of the box has a crack in it, and apparently I bought it that way. Sadness! But it's just the cover that is damaged, so I will still use it. Crack egg into a bowl and then add the spinach. Whisk until combined a little frothy. Heat a pan over medium heat. Add butter to pan and let butter melt. Add egg mixture and cook, while shaking and tilting the pan so that the eggy mixture fluffs up a bit. Alternately, you can use a spatula to move the egg curds towards the middle of the omelette and let the runny parts of the egg move to the outside. Once the omelette is nearly set, sprinkle the truffle salt along the middle. Use your spatula to roll up the omelette. Remove from pan and allow to cool. Cut into segments and place in bento. Makes enough for one serving. 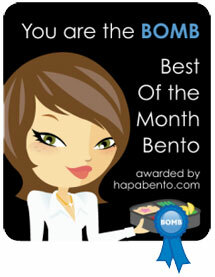 Don't forget to enter my big ol' 50th bento post giveaway! It looks great!! I love finishing salts. I almost bought a Black Truffle salt but wasn't sure what to use it in. My favorite is some jade salt with bamboo essence. Too bad about the crack. I love the box! I live just a couple of blocks from Savory. My favorite things so far are the Cambodian Lemongrass Curry blend and the Smoky Hills Cheese Powder. Haven't tried the truffle salt; I'll be sure to sample it next time I go in. I need to find local egg farmer, especially with the recall. I love spinach omelettes! Have not yet tried black truffle salt, but I must! I have this box too. Pretty! Thanks Patrizzia! It was pretty darn yummy. I haven't heard of jade salt with bamboo essence. Sounds cool! Hi Naomi! I have seen a few people mention that the Cambodian Lemongrass Curry is excellent. I'll have to try it. And do you use the Smoky Hills Cheese Powder on popcorn? YUM! Good luck finding a local egg supplier, sheri! Do you get a chance to go to any local farmers markets? Sometimes vendors who you think wouldn't sell eggs actually do. There's one at my market who will sell them only to a list of people, but you can request to get on the list. And Hector sells mostly honey, but he does have eggs too. Lia, there are so many great flavors to explore. It's really fun to try new things! I checked the price on the truffle salt. $9 an ounce; OUCH! dragonmamma, yeah, it is a little expensive, but when you think about how much truffles cost, it is a pretty good deal. Plus, you use the salt as a finishing salt, and so it should last a while. I would think that an ounce could last for a year, depending on how often you use it. Elegant bento, lovely post SB! Would love to try Black Truffle Salt, thanks for writing about it. A meal of fresh pasta, truffles and local olive oil will always stand out in my flavor-memory of visiting Umbria...as you said, earthy, sensual, complex! I have some truffle salt but not sure if it's "black". LOL! But will give it a try for sure. Thanks for posting this delicious recipe. 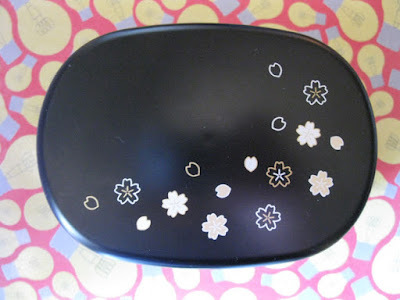 I have this bento box too; compact but holds quite a bit of food. You've packed it beautifully. Yum! Wow, bentobird! 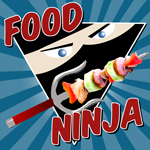 That sounds like such an amazing food experience! I've never been lucky enough to try fresh truffles.